Up in his office, Newman has a meeting about a 25-minute time slot on Saturday evenings that needs to be filled. He pushes for a science-fiction show for the kids, citing the popularity of the genre among young people. The other BBC bigwigs are dismissive and scornful. Oddly, no one mentions the three Quatermass series, which were hugely successful for the BBC in the 1950s; Professor Quatermass was obviously something of a forerunner of the Doctor so it wouldn’t be strange for him to come up in the discussions. At a party at her swank London flat, Verity Lambert (Jessica Rainec) and her actress friend Jacqueline Hill (Jemma Powell) are commiserating over their careers and watching Valentina Tereshkova, the first woman in space, on TV, when Verity gets a phone call from Sydney. She worked as his production assistant at ABC. He has a job for her now that he’s at the Beeb. The new show’s director will be Waris Hussein (Sacha Dhawan). As the BBC’s first Indian director, he faces casual racism much in the same way Verity faces sexism once they get down to work. Both probably had to deal with worse crap in real life than shown here–being ignored, snide remarks, for Verity the rumor that she only got the job because she’s sleeping with Sydney. She mentions that she’s Jewish, so there was likely some antisemitism thrown in too. The two bond quickly as outsiders in what Verity calls this “sea of fag-smoke and tweed and sweaty men,” though she hastens to add that she doesn’t mind sweaty men under some circumstances. Now, who will they get to play the main character on their show? The original casting director, ignoring Verity’s idea that the Doctor should be an older man, pushes for young actors they can make up to look old. She gets her way, though. “Curmudgeonly” would be a kind word to describe Bill Hartnell at this point in his life. 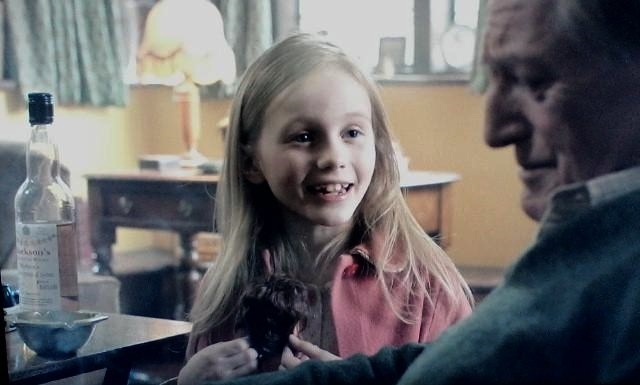 He’s so brusque with his granddaughter that she runs out of the room. It’s not really the little girl he’s angry at, not as if she gets between him and his bottle of whisky; it’s that he’s just finished up work for a comedy series in which he played one of the humorless sergeant majors which have made up too many roles in his career, and is gloomy at the prospect of either not getting another job or being asked to do more of the same when he feels it’s beneath his abilities as a legitimate stage and film actor. The rest of the main cast is chosen, including Verity’s friend Jacqueline, and production gets underway. The familiar theme music is composed, the electronic opening credits effect created, and the distinctive groaning sound of the Tardis achieved by dragging a latchkey across piano wires. The studio they’re given to work in is too small and the lights are too hot, but they make do with it. Verity has to nudge and cajole the Design Department to create the Tardis interior for her. 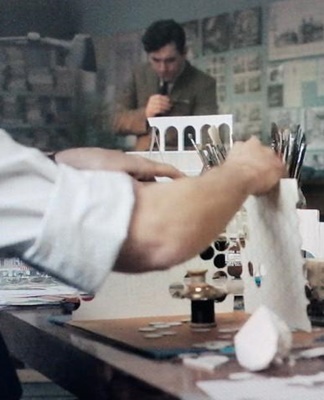 At the last minute, the guy whose been dragging his feet grudgingly slaps together some odds and ends on his desk: a couple of spools, a large brass knob, and some white walls made of stencil paper with little circles punched out. First, they film a pilot episode, “An Unearthly Child,” in which two schoolteachers, Ian and Barbara, are curious about a strangely precocious student named Susan. They follow her home one evening to find that she lives in a junkyard in a police box with her grandfather, and are surprised to discover that the box is really a spaceship/time machine that’s much bigger on the inside. 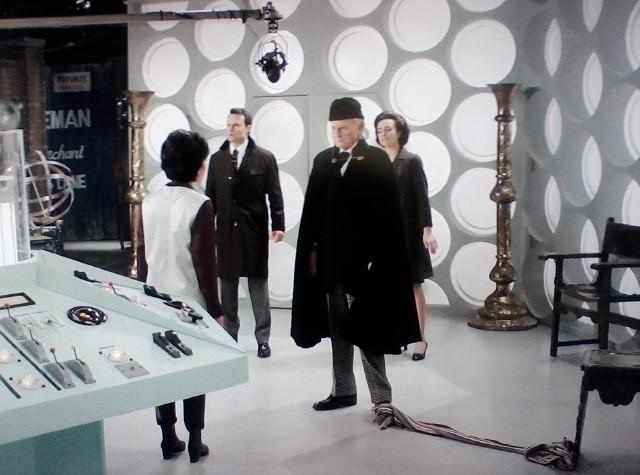 Scenes from the pilot where Ian and Barbara first meet the Doctor and stumble into the Tardis are recreated, warts and all, including flubbed lines, the Doctor’s scarf sliding off a chair and onto the floor, and the Tardis door’s popping open to reveal a couple of set crew outside. The Tardis interior scene is interrupted when the studio lights get so hot that they set off the sprinklers (which was a real danger in that studio but did not actually happen during the pilot). Waris and Verity show their first effort to Sydney, but he doesn’t like it. Over dinner in a Chinese restaurant, he lists his concerns: Take out the reference to the 49th century, since the origin of the two time-travelers shouldn’t be so specific; Susan should be more cheeky, like a typical teenager; and the old man shouldn’t be so nasty. Sydney doesn’t like the electronic effect opening either–he thinks it’s too scary for kids–but Verity defends that. As for the rest, they have to do it again. Verity apologizes to Bill. He was right about the character of the Doctor. So they do it again, but with more twinkle this time. No one is crazy about the script of the initial story, about a trip to the Stone Age, but it’s the only one that’s ready. Once Sydney approves the remade pilot, they get on with it, using polystyrene rocks. The show is ready to air. “An Unearthly Child,” debuts on an unfortunate night–November 24, 1963, the day after President Kennedy is shot. Even in the UK, everyone’s watching the news instead of some new children’s science fiction series. When Verity submitted the script for the next storyline, written by Terry Nation, just before the assassination, Sydney didn’t like it. From the beginning, the two things he hates about “cheap-jack” sci-fi and wants to avoid on this show are robots and bug-eyed monsters, and to him these new monsters look exactly like that. He contemptuously mispronounces the name: Daylecks. Dorlocks. But Verity shows exactly the “piss and vinegar” that he hired her for in defending the story idea. 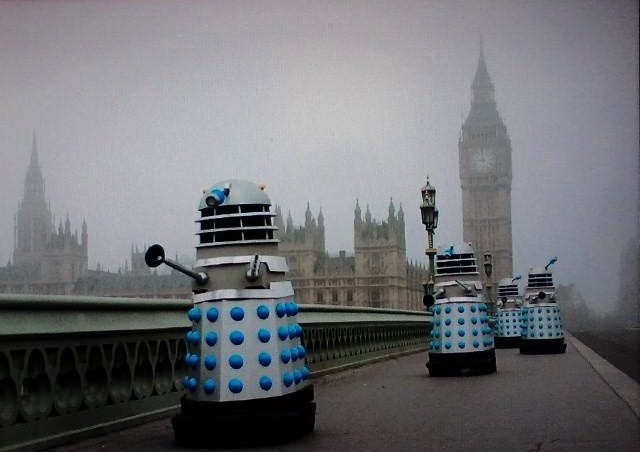 The Daleks are not bug-eyed monsters. They used to be like us, before endless war and radiation forced them to encase themselves in their metal shells. They hate everything that isn’t like them, but it will be up to the Doctor to show them another way. Yeah, good luck with that, Doctor. As of New Year’s 2019, she was still fighting with at least one of them determined to take over the Earth. Verity also gets Sydney to repeat the first episode the next Saturday before the second one airs, to give it another chance to be seen. During filming of the Dalek’s introduction, there are some behind-the-set jokes about the egg-whisk and plunger attachments, but also the opinion that these shrieking giant pepper-pots are genuinely creepy. 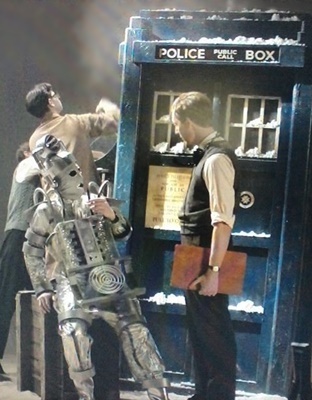 I know a lot of people object to the modern, candy-colored Daleks, but I note that the original ones for black-and-white telly were metallic silver with baby-blue dots and trim. The BBC can’t cancel the show now that it’s a big hit. Bill Hartnell attains a celebrity status he never imagined. Kids all over the UK admire him. He’s a hero to his granddaughter. His attitude becomes much less irritable. He happily signs autographs and even plays “Run from the Daleks!” with a group of school-children he and his wife encounter in the park. The Tardis’s Year-Ometer shows us that time is flying by swiftly now. Everyone is enjoying their success, but the original cast and crew begin to break up and go on to other things. Waris goes off to direct another BBC drama, A Passage to India. Carole Ann Ford decides that “There’s more to life than screaming at nasty monsters,” and the Doctor makes a moving farewell speech as his granddaughter leaves the Tardis for the last time. Publicity shoots in the atrium of Television Centre show us changes of cast, as Vicki comes in to replace Susan, and Ian and Barbara in turn depart and are replaced by new actors. William Hartnell believes that the Doctor is irreplaceable, but his health is beginning to decline. His flubs are more frequent, and he calls his directors “Waris” long after Waris is gone. Mrs. Hartnell (the always excellent Lesley Manville) finally confides to Verity that Bill has atherosclerosis–a word neither of them is familiar with, so she clarifies, “hardening of the arteries.” It’s all that smoking and drinking, plus the pressures of working year ’round on a TV series. He has to takes things more easy, but his wife knows he won’t quit the show; he loves being the Doctor. Can’t Verity help by taking some of the burden of the work off of him? After Verity’s departure, Bill goes downhill fast. He forgets whole speeches, wandering off into mumbles, gets distracted by the set lights and by people wandering around behind the cameras, and is increasingly irritable with the new directors and set crew he has to work with. 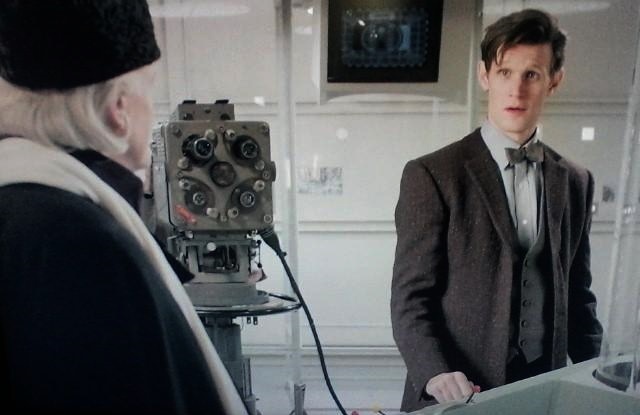 It looks like most of the old hands are gone too; he’s the only one who knows how to turn on the Tardis console. Doctor Who to go on, but not with you.” Then he shows him a photograph of their choice for a replacement, Patrick Troughton. 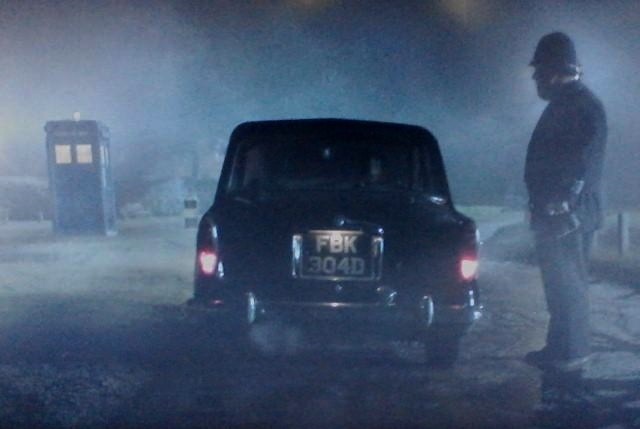 This is where we came in, with William Hartnell sitting in his car in a country lane with a policeman tapping on his window. On his last day as the Doctor, he stands at the Tardis console. 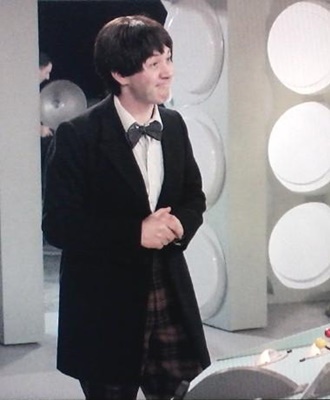 Patrick Troughton (played by Reece Shearsmith and looking younger than Patrick Troughton did) stands waiting just off-set to step in for the Doctor’s first regeneration scene. Even though he doesn’t want to go, Bill Hartnell is kind and encouraging to his replacement, saying there’s no other man who can take over for him. He reaches for the switch to start the Tardis. Placing his hands on the console, he prepares for his last scene. Then he looks up and in a lovely, moving moment that took me by surprise the first time I saw it, sees his successor. Not another actor as Patrick Troughton. Actual Matt Smith, who was the current doctor at the time. It’s not the first time Doctor Who has made me cry. 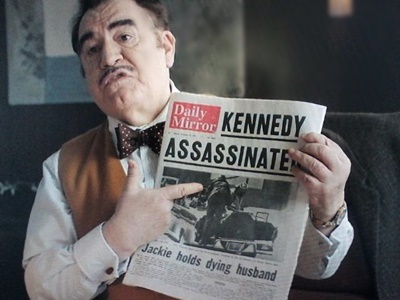 When I looked up information about this show, I discovered that there is some fudging of events–for example, the first Dalek episode was already being filmed before the Kennedy assassination–but there’s so much that’s wonderful here for a Doctor Who fan. A short feature about William Hartnell hosted by his real-life granddaughter Jessica (renamed Judy in this show) with tributes from some of the subsequent Doctors and a bit about how his reappearance in “The Three Doctors” was handled, considering that he wasn’t able to remember lines by that time. The making-of An Adventure hosted by Carole Ann Ford, which ends with the show’s writer, Mark Gatiss, dressed as the 3rd Doctor to perform his own just-for-fun recreation of a regeneration scene. The full length recreation of the original series scenes we see snippets of on the show. An extra DVD containing both the rejected and aired versions of “An Unearthly Child” plus the rest of the first storyline with the cavemen. I’m going to review these later. The first and fourth episodes have audio commentary, one with Verity Lambert and the other with Waris Hussein. All the aired episodes also have an informative text commentary. 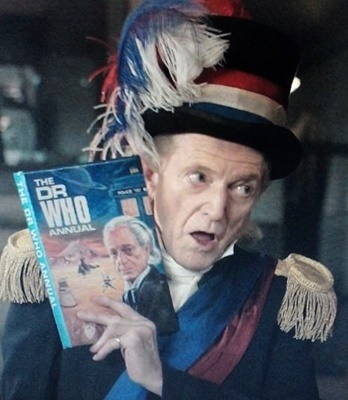 a Bradley would play the 1st Doctor again, including a recreation of this same regeneration scene for a second time, in the 12th Doctor’s final episode, “Twice Upon A Time.” This show’s writer, Mark Gatiss, also appears in that episode as a WWI officer, Captain Lethbridge-Stewart, grandfather of the Brigadier and great-grandfather of UNIT head Kate Stewart. b The doorman is played by Bill Russell, who was Ian Chesterton, one of the Doctor’s first companions. d In the 2007 episode “Human Nature”, the 10th Doctor, while in hiding in 1913 as a schoolmaster at a boys’ academy, claims that his parents’ names are Sydney and Verity, as a tribute to these two show founders. e The BBC bigwig who delivers this line is played by Mark Eden, who in addition to small parts in Dr. Zhivago and The Prisoner was also Marco Polo in one of the 1st Doctor’s storylines. f I think the woman who calls her children inside to watch Doctor Who is Carole Ann Ford, the Doctor’s granddaughter Susan. She’s in the end credits as “Joyce,” but I’ve watched this show several times and haven’t heard that character name anywhere. g I still do this when watching episodes with Daleks in them. It freaks the cats more than my Borg impression or when I point at them and imitate Donald Sutherland at the end of the 1979 remake of Invasion of the Bodysnatchers. h At Verity’s farewell party, you can spot Anneke Wills, who played Polly, one of the Doctor’s companions at the time of his first transition, as well as Jean Marsh. Jean Marsh surprised me, since I know her very well as the co-creator and one of the stars of Upstairs, Downstairs, but wasn’t aware of her connection to Doctor Who. I’ve looked her up on IMDB; she was briefly a 1st Doctor’s companion called Sara Kingdom in episodes I haven’t seen, and was once married to Jon Pertwee, the 3rd Doctor, back in the 1950s.